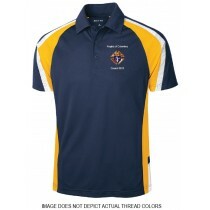 Sport-Tek Navy, Gold and White 100% Poly Short Sleeve Polo. Order yours and we will call you when it is done. Please allow 2 weeks. Choose LOCAL PICKUP to pickup at our store in Le Mars or you can pay for shipping to your home.